The walrus (Odobenus rosmarus) is a large marine mammal found inhabiting the freezing cold and icy waters of the Arctic Circle. Walruses are pinnipeds. The word pinniped means fin or flipper-footed and refers to the marine mammals that have front and rear flippers. Walruses inhabit areas in the Arctic that are largely made up of ice. They prefer areas with shallow water so they can easily access food. This slow moving marine mammal spends the majority of its time in or around water. Walruses migrate north during the summer and south in the winter. The migrations ensure that the walruses can be where the most optimal ice is found. Optimal is defined as relatively thin ice but thick enough to hold the enormous weight of their bodies. The average lifespan for walruses is between 30 to 40 years in the wild. Walruses are among the largest pinnipeds – only two species of elephant seals are larger. While some outsized Pacific males can weigh as much as 2,000 kg (4,400 lb), most weigh between 800 and 1,700 kg (1,800 and 3,700 lb). Length typically ranges from 2.2 to 3.6 m (7.2 to 11.8 ft). Male are larger than females. The grayish skin of the walrus is 2–4 cm (1–2 inches) thick, with deep folds around the shoulders. The skin is covered with short reddish hair, giving the animals an overall cinnamon colour. The walrus has a rounded head, small eyes, and no external ears. Its muzzle is short and broad and has a conspicuous moustache of stiff, quill-like whiskers (vibrissae). The most prominent feature of the walrus is its long tusks. These are elongated canines, which are present in both male and female walruses and can reach a length of 1 m (3 ft 3 in) and weigh up to 5.4 kg (12 lb). These tusks can break through 20 centimeters (8 inches) of ice. They also assist walruses in climbing out of the water and onto the ice. Walruses climb up on ice or beaches to sleep or to rest. They move awkwardly on land but are swift in the water. Walruses usually swim at an average speed of 7 km/h (4.3 mph), but are able to swim as fast as 35 km/h (21.7 mph). Walruses generally breathe at the surface for about one minute after every five to eight minutes of subsurface activity. They can stay submerged for as long as 10 minutes. A walrus’ bottom-dwelling prey usually inhabit waters no more than about 80 m (262 ft) deep: a walrus generally dives no deeper than this. But most feeding probably takes place between 10 and 50 m (33 and 164 ft). Because visibility is poor in deep and murky waters, walruses rely on their whiskers to locate food. 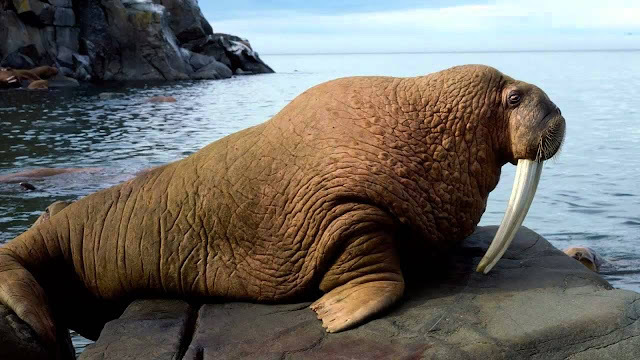 Walruses prefer molluscs – mainly bivalves such as clams. They also eat many other kinds of invertebrates including worms, gastropods, cephalopods, crustaceans, sea cucumbers, and other soft-bodied animals. Walruses may occasionally prey on fishes such as polar cod. Adult walruses eat about 3% to 6% of their total weight per day. They may eat as many as 3,000 to 6,000 clams in a single feeding session. Research has shown that the walrus is a very social type of creature. In fact, they are among the most gregarious of animals. Walruses are almost always found in large herds no matter what they are doing. It is extremely rare that you will find a walrus by itself. Walruses communicate through auditory and visual displays. Walruses are among the most vocal of the pinnipeds. They produce growls, taps, knocks, grunts, barks, soft whistles, rasps, and clicks. Male walruses produce bell-like sounds below water. These sounds are not produced by the vocal cords but originate from air sacs, which extend from the pharynx. During courtship, males display visually and vocally from the water. Males will mate with multiple females in one mating season, while females only mate approximately every two years. This results in walruses having the lowest reproduction rate of all the pinnipeds. Gestation lasts 15 to 16 months. Calves are born during the spring migration, from April to June. They weigh 45 to 75 kg (99 to 165 lb) at birth and are able to swim. The mothers nurse for over a year before weaning, but the young can spend up to five years with the mothers. Due to its great size and tusks, the walrus has only two natural predators: the killer whale (orca) and the polar bear. Adults use their giant tusks as a weapon to defend themselves. The young walruses are more susceptible to predation. Currently, two of the three walrus subspecies are listed as “least-concern” by the IUCN, while the third (Laptev walrus) is “data deficient”. The walrus plays an important role in the religion and folklore of many Arctic peoples. Skin and bone are used in some ceremonies, and the animal appears frequently in legends.